1. Layer half of ham, potatoes, and onions in slow cooker. 2. Sprinkle with half the salt and pepper, and then half the shredded cheese. 4. Spoon undiluted soup over ingredients. 5. Cook on low 8-10 hour or high 4 hours. 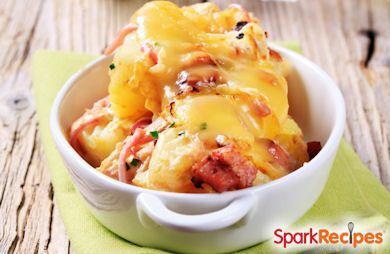 Recipe submitted by SparkPeople user SHANNJ77. Mmmm..... sounds good - I may have to try that next time as well!